There’s no denying that the responsibilities of brand sales representatives have changed significantly over time as wholesale has evolved. Gone are the days where brands had sales reps drive miles and miles from retailer to retailer to sell their latest products. Today, brands rely on trade shows and technology to showcase their collections, and invest in specialized tools for sales reps to increase efficiency. The relationship between sales reps and retailers has grown to be much more collaborative than it used to be. With the recent shift from pre-season buying to in-season buying, retailers are placing orders more frequently than ever before and are turning to sales reps for their expertise. Sales reps have become more consultative to retailers, and are expected to regularly provide personalized recommendations and strategic insight. In our recent survey, we asked over 400 wholesale brands about their sales rep hiring plans for 2018. According to our results, over 50% of brands are planning to hire new reps this year to help retailers keep up with consumer demand. Additionally, 30% of brands reported that they are relying more on inside sales reps than outside reps to help fuel their revenue growth. Contrary to fears that technology is replacing the need for inside sales reps, it actually enhances the sales process and gives reps a greater opportunity to achieve their goals. With brands’ primary sales strategy for 2018 to sell wider and deeper into existing accounts, inside sales reps need specialized tools to make this goal a reality. 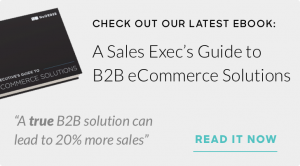 B2B technology gives inside sales reps the ability to upsell clients easily and effectively with all of their product and inventory data available online. Just as consumers enjoy receiving product suggests throughout their shopping experience, retailers appreciate when brands take the time to handpick product recommendations for their store. Personalization is key, and with a B2B platform inside sales reps can speak directly to their retailer’s needs through custom linesheets, email campaigns and visual merchandising. Inside sales reps can also use account and product performance data to help retailers make more informed buying decisions. For example, if a purple striped sweater is a top seller, inside sales reps can use that information and suggest it to a buyer who has not yet purchased it for their store. With all of this insight accessible in just a few clicks, inside sales reps always have the inside scoop to present to their retailers. Technology to a sales representative today is like a car to a sales representative pre-digitization. It not only helps sales representatives get to where they need to be, but it helps them get there faster and with everything they need to make a sale. 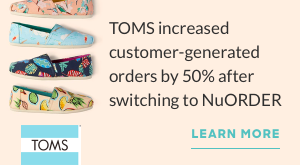 To learn how a B2B eCommerce platform like NuORDER can benefit your sales representatives, request a demo today.